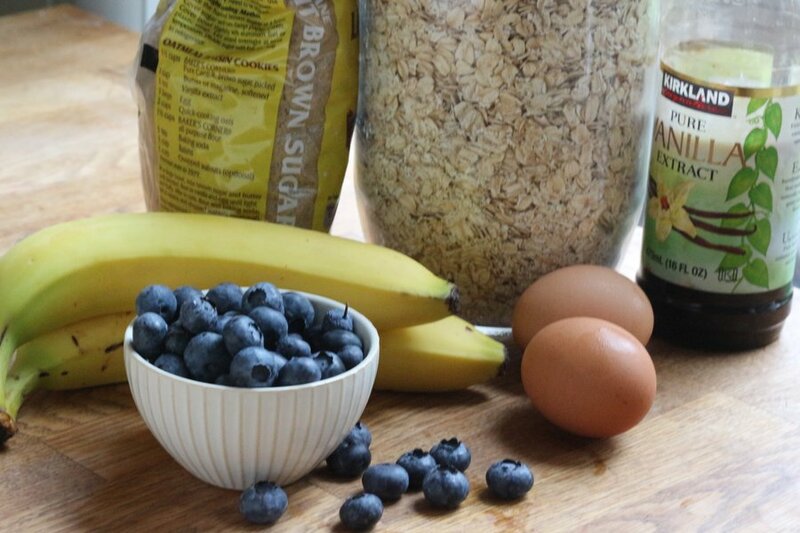 Try this healthy banana blueberry oatmeal muffins recipe if you are having the breakfast blues. I get so bored with the same food for breakfast but I don’t want to cook! This recipe only uses one bowl and is very, very quick. 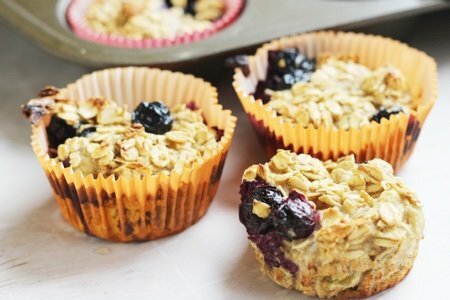 This is a lighter muffin and uses bananas and blueberries for flavor instead of a ton of butter and sugar. My zucchini breakfast muffins and apple oatmeal muffins are both cut from the same cloth. 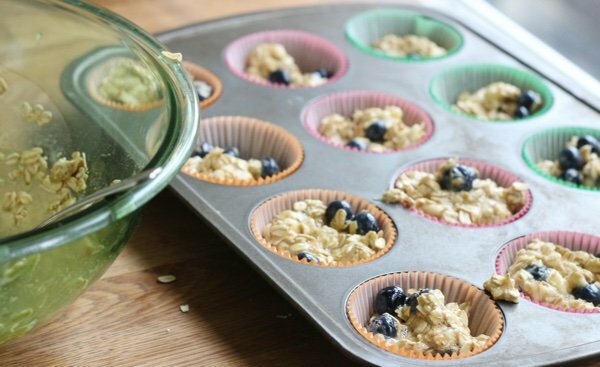 Why do I keep making muffins with oats, fruit (or vegetables) and less sugar? I like them and they are fun. Once you get going on these types of muffins, the fluffy ones are much less appealing as they taste super sweet. Also, I love the ease of this recipe. I don’t have to cream the butter and the sugar – just mix in the ingredients with a fork! 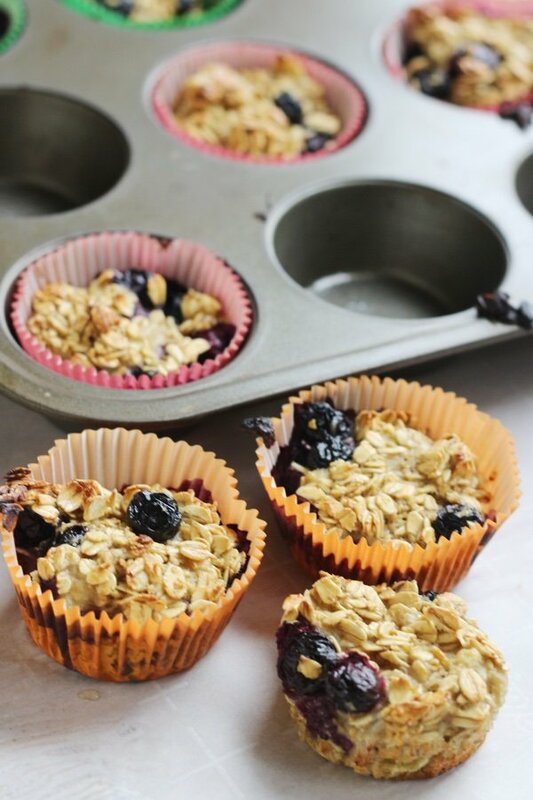 I use muffin liners for easy clean up and it makes them far easier to take with me for a snack. These can be gluten free if you used gluten free certified oats in the recipe. Oats should always be gluten free except that they are typically processed on the same equipment as wheat. The wheat mixes in with the oats and if you are Celiac or very sensitive to wheat – you will have a reaction. My kids like these with a spread of peanut butter or warmed up in the microwave for a few seconds. These are also a great alternative for a packaged granola bar. They have 5 grams added sugar per serving (which I don’t think is so bad). If you try to make them without the sugar – they may not stick together. Sugar provides an excellent “glue” along with the eggs. What is your favorite healthy take on a muffin? Preheat oven to 425 F. Line a muffin pan with muffin cup liners. Mash bananas in a medium bowl and mix in eggs until blended. 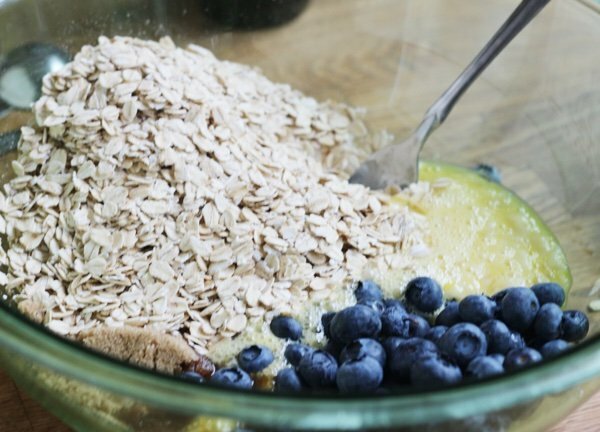 Add oats, blueberries, brown sugar, cinnamon, and vanilla until mixed. Divide batter into 12 muffin lines and bake for 15 minutes or until slightly browned. Serve when cooled or store in refrigerator or freezer. @Maribel - I don't think one of these is enough for breakfast. I would have it with peanut butter and an apple or eat two with a hard boiled egg. I had 2 ripe bananas I was about to toss, and had some frozen blueberries on hand, so I decided to make these, and they're a home run! I wanted them to have more protein for additional satiety to maybe be a great breakfast all on their own, so I added 2 scoops of vanilla protein powder in place of the vanilla, increasing these to 8 grams of protein per muffin. All else is the same. The powder is sweetened with stevia, so the muffins are sweeter than they would be otherwise, of course. I will probably leave out the brown sugar next time and just let the powder sweeten them. I love the density of these and how filling they are! My kids and hubs are all liking them, too. Thanks for the idea!